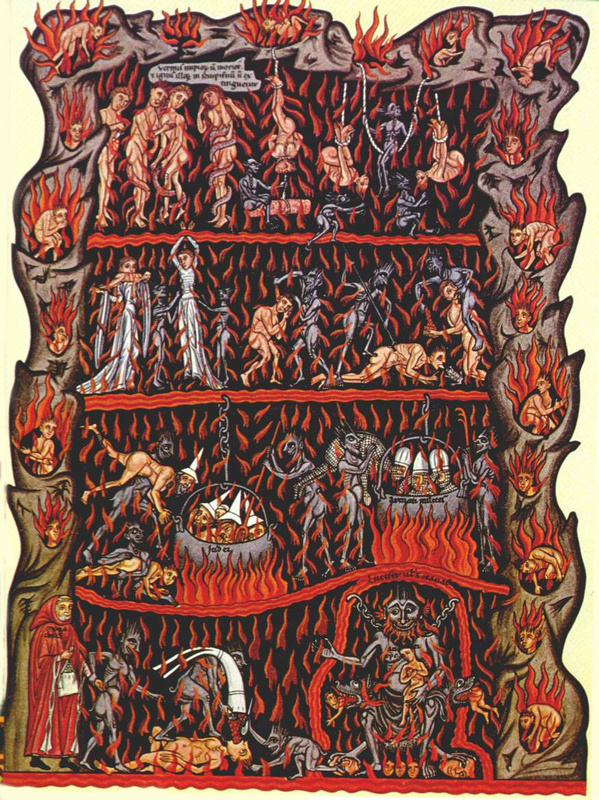 I’ve posted several times on the new resource from the publishers Christian History, a compact little survey and resource guide on the history of Christian thought about hell. The project was ably managed by Jennifer Trafton and written by Jennifer, myself, and that redoubtable pair Edwin and Jennifer Woodruff Tait. Jennifer Trafton wrote a splendid annotated bibliography containing brief summaries of over 50 books contributing to the modern debates on hell. For the main, “timeline” section of the publication, the four of us divvied things up chronologically. The medieval period saw a shift in em­phasis from the early church’s focus on the biblical “Last Things”—the Second Coming of Christ, general resurrection, and final judgment—to a new concentra­tion on the afterlives of individuals. Until the 400s and even beyond, Jesus’ return was still expected imminently; thus those who died in the intervening generations could be thought of as simply sleeping or awaiting the resurrection. There was not much written during this early period about the immediate fate of those who died before Jesus returned. As the Second Coming came to seem more remote, however, Chris­tians increasingly focused on the doc­trine of the immediate judgment of each soul at death. The Book of Rev­elation in particular began to guide Christian imagination on people’s fate after death. This emphasis on the af­terlife resulted in a lavishly visual and grotesque new genre of literature: the vision of the otherworldly journey, of which Dante’s Divine Comedy repre­sented the pinnacle. In these journeys, more words were usually lavished on the descriptions of hell than on purga­tory or heaven—and the imagery in­cluded eternally burning fire, snakes, boiling kettles, fields of eternal ice, rivers of swirling sulfur, and demon-administered tortures. Often these visionary journeys pur­ported to show readers hell from the vantage point of a person who had died (briefly), visited the realms of the dead, and returned to tell the tale. The goal of such stories was almost always to exhort the reader or hearer to live morally on earth, avoiding the sins that condemn the damned forever. In the development of Christian doc­trine about hell, the early scholastic theolo­gian Anselm of Canterbury is best known for arguing for the eternal timespan of pun­ishment in hell by an analogy from feudal law. In feudalism, the severity of the pun­ishment for an offense was determined not so much by the nature of the offense as by the relative worthiness of the one offended against. Stealing from a king resulted in a steeper punishment than stealing from a serf, for example. On this basis, Anselm concluded that a crime against God’s in­finite honor deserves an infinite punish­ment. However, since humans are finite, we can pay the penalty for our sins only by suffering for an infinite time. The Cathars, a Christian sect that sprung up in France and other parts of Europe, were dualists. They believed that earthly existence, including the human body, is evil, created not by the Christian God but by an evil god. The God whom they worshipped was a being of pure spirit who would never have stooped so low as to take on evil flesh. Thus they de­nied that Jesus could become incarnate and still be the son of God. They denied, too, the Christian understanding of the crucifixion and the cross as saving things. The Catholic Church saw the Cathars as dangerous heretics and persecuted them ruthlessly, even launching a crusade against them (the “Albigensian crusade”). Not surprisingly, the Cathars also re­jected the traditional Christian doctrine of hell. For the Cathars, this world was the only hell (and it was hell enough, giv­en the persecution they suffered). There was nothing to fear after death, except maybe a sort of reincarnation that some of their sect taught. Their objective was to escape from the cycle of reincarnation, to earn the right to go to heaven and avoid another term of imprisonment here in hell on earth. Thomas also addressed the charge, which is also heard from some modern critics, that God has somehow been lim­ited in his omnipotence if any must go to hell (thus thwarting his divine plan in cre­ating humanity to share divine blessedness with him). He acknowledged that God’s goodness demands that all be saved (1 Tim. 2:4). But he also argued that the manifesta­tion of God’s justice (or his hatred of sin) requires that at least some people should sin so that they may be justly punished. Thus God’s will to save all is modified by the demands of his justice and produces a compromise: He will save the elect, thus manifesting his mercy, and damn the rep­robate, thus manifesting his justice. Aquinas also contributed the notion of a “limbo” where unbaptized infants would avoid the worst penalties of hell. Limbo was still a part of hell, because infants were still stained by original sin, but they were allowed to suffer only the absence of God and not the physical tor­ment vividly pictured in so many medi­eval writings and artworks. No medieval treatment of hell springs to mind more readily today than Dante’s Inferno—the first of the three books of his Divine Comedy. According to the poem, one day in 1300 Dante found himself wan­dering in a gloomy forest. After encoun­tering three ravenous beasts, he was met by the Latin poet Virgil, who promised to conduct him through hell and purgatory. 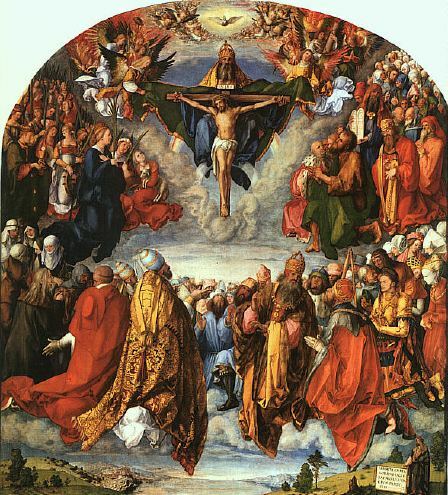 On the evening of Good Friday, April 8, they entered the gate of hell (over which are the famous words: “Abandon hope, all ye who enter here”), and they began to travel through its successive circles. In Dante’s imaginative vision, hell is an in­verted cone with its apex at the center of the earth. The upper circle is that of the Elysian Fields where the noble pagans dwell. At each deeper level the travelers see punishments for more and more hei­nous sins, until they reach a frozen lake in which Lucifer himself punishes the most awful sinners of all: the traitors. The Inferno is intentionally repellent in its depiction of the Christian hell. Even the sympathetic Christian reader Geof­frey Nuttall said, “If the Inferno were the whole poem, one could hardly avoid the conclusion that Dante had a diseased mind, obsessed with sadistic and other sexual perversions.” But the denizens of Dante’s hell on some level want to be where they are. Their loves have become so disordered that they have arrived in hell of their own will. Dante agreed with Aristotle’s ancient opinion that the soul “forms” the body: people’s facial expressions, gestures, and body language bear witness to what is in their hearts. So, habitual sin changes the way we look (as our parents always told us: “Don’t make that face or it will stick that way”). Thus Dante had the sin­ners in his Inferno reenact forever in their bodies the very sins they had habitually practiced on earth. Those familiar with the Chronicles of Narnia by C. S. Lewis (a lover of Dante) will remember Eustace turning into a dragon in Narnia because he had had greedy, dragonish thoughts. This was exactly Dante’s point. Of course, as in Anselm’s “Meditation to Arouse Fear” and the medieval liter­ary tradition of journeys into hell, Dante showed his readers hell so they would turn to the God of loving kindness who does not desire that any should perish. Excerpted from The History of Hell: A brief survey and resource guide, from the publishers of Christian History magazine. This entry was posted in Medieval Wisdom for Modern Protestants and tagged Anselm of Canterbury, Cathars, Christian thought, Dante Alighieri, hell, History of Christianity, Middle Ages, Theology, Thomas Aquinas. Bookmark the permalink.